The Congress and the TDP, which is in power in neighbouring Andhra Pradesh and was formed as a consequence of an anti-Congress movement by film icon-politician N T Ramarao, held preliminary talks on Tuesday. The leaders of the three parties met the Governor on Tuesday. The last week's dissolution of the Telangana assembly months ahead of its scheduled end has spurred the opposition parties, including arch rivals TDP and the Congress, to explore the possibility of an alliance to take on the TRS of K Chandrashekar Rao. The Telangana Jana Samithi (TJS) of M Kodandram, a former associate of caretaker chief minister Chandrashekar Rao who was the chairman of Telangana Joint Action Committee (TJAC) which spearheaded the movement for a separate state, and other smaller parties could be part of the proposed 'grand alliance'. The Congress had backed the TDP-sponsored no-trust motion against the Narendra Modi government, and the two parties had voted together against NDA nominee M Venkaiah Naidu in the vice-presidential election. 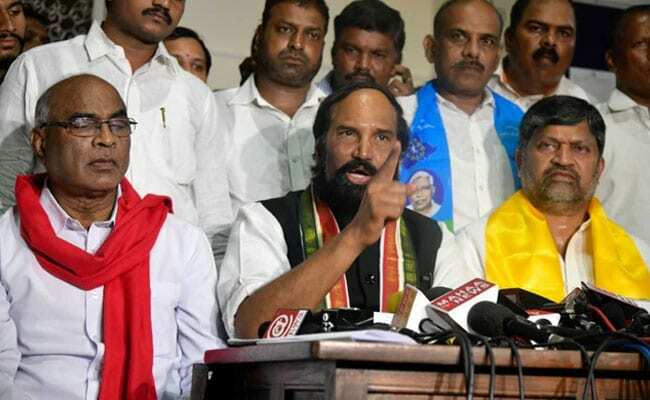 Noting that these parties wanted the "TRS misrule" to end, Telangana Congress president N Uttam Kumar Reddy said representatives of his party, the TDP and CPI met on Tuesday for a preliminary discussion. The TDP's state chief L Ramana said his party favoured a 'grand alliance' of opposition parties ahead of the assembly election as it was in the interest of the people of Telangana. Echoing his view, state CPI secretary Chada Venkata Reddy claimed the TRS dispensation, which ruled the state since its creation, disregarded democratic principles. Kodandram, a key figure in the Telangana movement, said his party had earlier decided against any pre-poll alliance, but had to change its strategy due to the current state of affairs. He, however, said his party would insist on the prospective opposition alliance having a common manifesto as it was the "fundamental thing". Kodandram said different parties had approached TJS to explore the possibility of forging an alliance. "Different parties have made this proposal. We met and discussed with them while trying to know their thinking. It (the alliance) has to be debated at different levels. "Political affairs committee will come back to the core group then the state committee will finalise the issue," he told PTI. Kodandram said he wanted a "pragmatic and programme-based" alliance in place where no constituent has to lose its identity. TDP supremo and Andhra Pradesh Chief Minister N Chandrababu Naidu has authorised its Telangana leadership to take a decision on alliance. "The TDP's presence in Telangana is a historical necessity," he said recently. In an indication that a broad-based opposition alliance could become a reality in Telangana ahead of the election, Congress, TDP, CPI and TJS leaders met Governor ESL Narasimhan on Tuesday and demanded imposition of President's rule in the state to ensure free and fair poll. "Even if KCR is only a caretaker chief minister, free and fair polls will not be possible in Telangana. We have demanded that elections be conducted after imposing President's rule," Uttam Kumar Reddy said soon after the meeting with Narasimhan. When asked how will there be a rapprochement between the Congress and TDP after years of acrimony, AICC in-charge for Telangana R C Khuntia said," Congress does not harbour bitter feelings for the TDP." The TRS has, meanwhile, called the opposition's move "opportunistic". "It appears some desperate efforts are being made to stitch together a 'Maha Ghatia Bandhan' (a wordplay calling the proposed alliance cheap or inferior to rhyme with Maha Gathbandan or grand alliance). "TRS had fought the 2014 polls alone and is ready again to face any opportunistic alliance," K T Ramarao, state minister and son of caretaker chief minister Mr Rao, said. The party-wise strength in the 120-member Telangana Legislative Assembly before its dissolution was TRS-82, Congress-17, AIMIM-7, BJP-5, TDP-3, Vacant-2, the CPI, CPI(M), indipendent and nominated member (one each). The TRS had bagged 63 seats in the 2014 polls but its strength rose over time with 19 MLAs from the opposition,including 12 from the TDP, three of the YSR Congress and two of the Bahujan Samaj Party joining it.